Shovels are often used to clear steps, keep the entrance of a building free of snow or ice buildup or when clearing a tight area too small for the plow to reach. 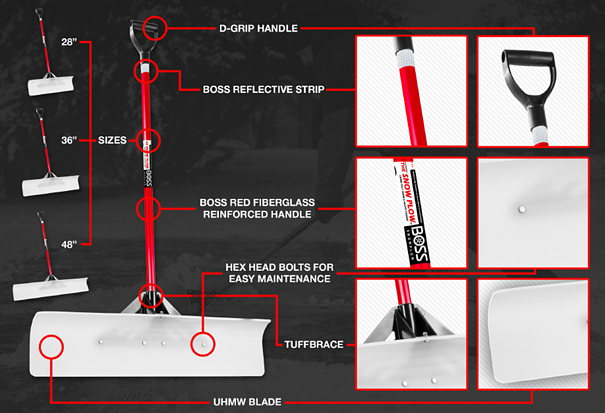 With this in mind, if you are considering the purchase of a quality shovel, there are key features that can make or break the performance of your snow removal tool. We know how much you want to get back in the truck and behind the plow, so get the shovel that will get the job done faster and cleaner. D-Grip Handle: Designed to fit bulky, gloved hands the D style grip allows for comfortable, powerful, ergonomic position. BOSS Reflective Strip: The added safety reflector provides visibility for crews working at night near traffic. BOSS Red Fiberglass, Reinforced Handle: The reinforced core insert plug provides additional strength and durability with twice the wall thickness of the industry standard. Hexhead Fasteners: Zinc fasteners make replacing components simple even after years of use in tough conditions. Tuff Brace: The patented handle/ blade connector provides a strong connection between the blade and the shaft for durability and performance. UHMW Poly Blade: Built for the abuse of the season, this highest wearing, impact resistant, cold weather adaptable, premium blade provides unmatched scraping performance. Sizes: Available in 28", 36" and 48" blade size. All of the features on the Snow Plow Snow Pusher add up to clean scrapes and time saved. The Snow Plow Snow Pusher can be purchased at your local BOSS authorized dealer. So, shovel that snow and get back into your heated truck, ASAP!